The so-called ‘gilets jaunes’ protesters (yellow vests) have captivated France’s imagination for nine days now and their protests continue. The apolitical and decentralized movement that began as a protest against the high fuel prices and taxes by now enjoys the support of 75 percent of all French citizens. On Saturday, the 'second act' of the protest was marred by riots in Paris. But the yellow vests will not allow their movement to be hijacked by violent rioters. A new protest in Paris has already been announced for next Saturday, demanding the resignation of France’s unpopular President, Emmanuel Macron. 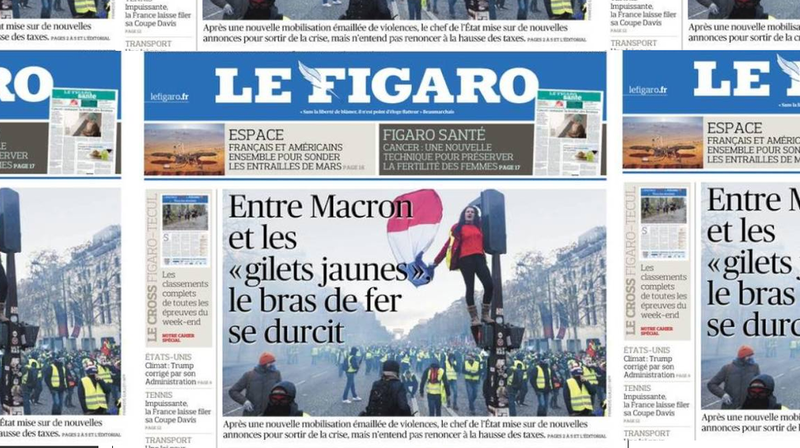 France wonders whether the yellow vests can actually bring about anything at the Elysée Palace as Macron so far held out from commenting. Complicating factor is the unstructured nature of the popular protest that has arisen spontaneously on Facebook. The yellow jacket movement has no leaders and no regular spokesman. The power of the movement is at the same time its weakness. If President Macron and his government are prepared to sit down with the yellow vests, the question is first of all with whom they should do that. Related coverage: Paris Riots – Government: ''Hundreds Of Far-Right Extremists'' Attacking Police (Video). The protesters are a mixture of the whole of France. Retired seniors, truck drivers, single mothers: the only common denominator is that they do not belong to the urban elite. The yellow vests see themselves as the 'underclass' of France, the citizens forgotten and neglected in the countryside and in the suburbs. For the time being, they lack a coherent set of requirements. The demonstrators do not want the fuel tax to be increased any more, they agree on that. But other than that their wishes differ from the reversal of the reduction of the maximum speed to the organization of a referendum on the presidency of Macron. President Macron will announce measures on Tuesday following the protests of the yellow vests. It is however unknown what exactly will be announced. French media speculates about a postponement of a new increase in fuel taxes. On 1 January 2019, these are supposed to be increased by 6.5 cents per liter of diesel and 2.9 cents per liter of lead-free petrol. Ms Brigitte Bourguigon, a centrist member of parliament and a party colleague of President Macron, has proposed postponing this increase for three months. Whether the president actually considers letting go of the planned taxes is unknown. He was elected with an agenda of far-reaching reforms, including the transition to a less polluting economy. It seems therefore unlikely that the centrist President would give in. France, you madr your bed by voting for this Rothschild back granny fucker. Y'all could have voted for LePen, but you didn't. Part of me thinks France votes for morons just so they can protest.